During my “free time” – I know, ha-ha right? – one of my passions is researching and either verifying or debunking strange and wild claims. In fact, together with a good friend from the UK, we started a website devoted to investigating such bogus science claims. While that research started primarily focused on Ufology, lately we’ve started branching out into fringe science and physics. Now, the fact that there could be legitimate science mixed in with all of the bogus science claims leads countless risk capital investors to throw their money away by investing in many of the snake-oil salesmen schemes. Due diligence only goes so far – some of these con-artists are brilliant at making quantum physics theory sound practical. So, where should people go to try and verify whether any of these fringe science claims are legitimate? I’m going to resist the urge to plug my own website, because there are so many sites out there that have been at this work for far longer – so here are the top 5 websites where you can research wild and bogus science claims. Exploring Fringe Science – To Debunk Or Not To Debunk? 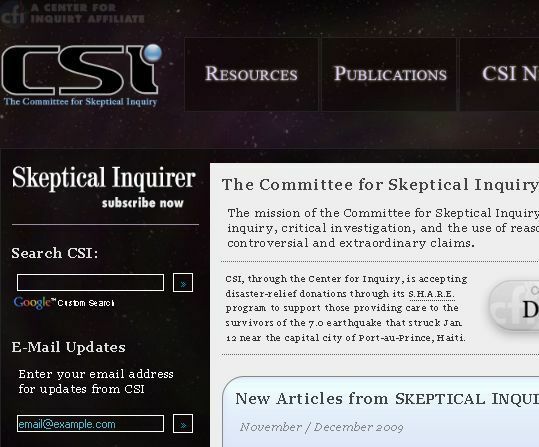 The first website is also one of my favorites – The Committee for Skeptical Inquiry. As a team, and with the support of Fellows and writers from across the world, this organization and website stands as a beacon of truth for all serious investigators in the areas of the paranormal and fringe science. The next excellent resource for hard-hitting reviews of the latest fringe research is Popular Mechanics.